Depends upon what you want in your vintage pen. Some gold flexible nib pens have gone way up in the market-- yes, the auction site may be a good place to check. However, if you want to take a look at Estherbrooks or other steel nibs you should be well below the $50 mark (or half that depending on the auction-- let me check). Yes.. should be below that. Some $35.00 buy it now show up-- and I'd say those are little high too. Of note on the Estherbrooks is that you can swap nibs easily-- getting interesting nibs can be a challenge. I think I have 3 Estherbrooks and they have the same nib. Lots of nice colors and they are a decent lever filler pen. There are other brands with steel nibs. +1 to Esterbrook. They were built to be everyday writers at low price point. They knew what they were doing back then. You can get them for less than $20 on ebay. They have a rubber ink sac in them and over the years they can petrify and crumble. So take that into account. I had recommended Esterbrook to 7formy1911 on anther thread and he got a NIB one but the sac crumbled and fell apart. The ones left to me that were found in Grandad's office worked just fine after a good cleaning, so it's hit and miss I suppose. Repairing/replacing an ink sac is actually quite easy. I've not figured out lever bar replacement well, however. There have been links in past for stores online about finding various sizes of ink sacs and which sac is appropriate for a given fountain pen. Unfortunately, the fountain pen hospital was my goto and has disappeared. They had nice bottles of shellac, sacs and other accessories for pen repair. It's a nice bottle. Is that black? Or brown. I use a pilot like that more than any other pen. It's a phenomenal value. I've never had to replace an ink sac. I may just have lucked out with the pens I've acquired. I'm all for learning and doing it myself if I can. If I ever need to replace one, I'll give it a try and if it goes badly I'm blaming you. Nibs -- for estherbrook? Andersonpens has some and ebay has some (don't overpay). OK so I won the auction for 3 Esterbrook fountain pens. I like the classic look of the black pens...all three are lever fill. So the pens arrived today...They are in very nice condition. as stated 2 of them n22d sacs but the top one seems to be ready to go...I just need to get some ink. You could pick up some Waterman ink at Staples or Office Depot/Max for immediate satisfaction. I do like Noodler's ink and the Pilot ink (and more recently with the cooler bottle but higher pricetag). I've been using fountain pens for about 6 years. I've got more ink than I know what to do with and have some favorites. Pilot Metropolitan. I don't think there is a better value. Twisbi 580. I dropped this one and it broke, but up until then, it was a great pen. 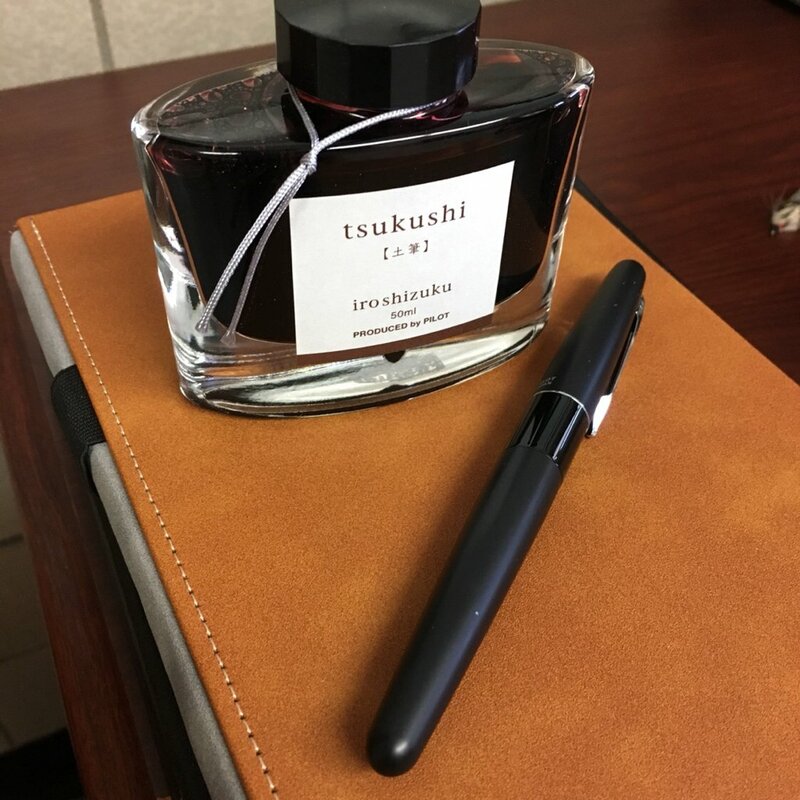 I went to Dromgoole's this week and was able to pick up a Twisbi Eco clear in a medium nib, Noodler's Texas Navy and Noodler's 54th Massachusetts. So, I have been carrying my Esterbrook pen everyday for work. No ink stains on my shirt and so far so good. But I have to fill it every 3 days, and I am not writing that much...is that normal? How much should I be able to write with a "full tank"? Somehow I missed this question. It's a dark brown. Generally speaking, I like it a lot. It seems to be of good quality, it behaves well, and I like the color. The only complaint I have, is that on some papers it dries to more of a greenish brown. I typically use an Ampad Gold Fiber legal pad and the color looks great, sometimes almost black on that. So I have been enjoying my Esterbrock pen...not writing in my hunting journal, but still enjoying the pen. My work partner saw me using it and commented on how much she liked fountain pens, but she only had on old one that didn't work...I needed an idea for a Christmas present for her, so there it was. 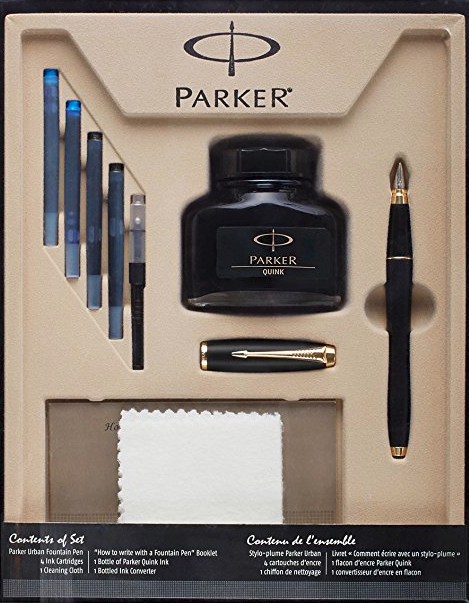 I ordered a "Set", it is a Parker Urban pen, a bottle of ink, insert tubes of ink and a converter, so it can be used with the ink tubes or with the bottled ink. It came in yesterday and I was stunned at how nice it was...all packaged in a beautiful boxed set and the pen...wow a very nice feel and a solid/quality feel to it. I got it off Amazon and it was on sale...A very nice set up should you have the need. Yup that is it...I didn't expect a "Gift Set" I was thinking just a couple of items in boxes...this is a great gift.